This skills section provides a quick review of how to change the helium tanks on the AutoCAT® 2 series IABP. Shows the location of the drain bottle and how to empty. This skills section reviews the options for connecting AP signals to the AutoCAT® 2 series, including the FiberOptix® signal, an AP transducer or a slave connection from an external monitor. Zeroing of the FiberOptix® sensor and transducer is reviewed. Available AP alarms are reviewed. 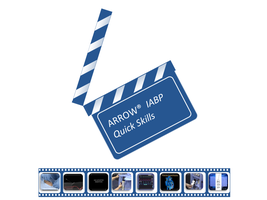 This skills section reviews how to connect the IAB to the AutoCAT® 2 series and the various IAB connectors (color coded) that are available. A review of how to change volume is provided. This skills section reviews the options for connecting ECG signals to the AutoCAT® 2 series, including the 5-Lead ECG skin cable or a slave connection from an external monitor. A review of how to select the optimal input should be chosen. The procedure to change leads, set gain and select gain mode (Auto or Manual) are reviewed. This skills section reviews and demonstrates how to zero the fiber optic sensor (FOS) sensor prior to insertion, including the screen indicators that confirm the zeroing process and completion. This section also reviews the process for calibrating an fiber optic sensor (FOS) sensor, including the operations and screen prompts that indicate when calibration has been performed. This skills section provides a review of Operator set timing using Operator mode in the AutoCAT® 2 series. A review of timing principles, rules and errors is shown. This skills section provides a quick overview of alarm handling.